New poll results from Rasmussen released Monday reveal that a majority of Americans do not want to send “a significant military force” to fight ISIS on the ground in the Middle East—despite viewing the terrorist group as a serious threat. In June of 2014, just 16 percent of Americans wanted to send troops back to Iraq to fight ISIS, according to Public Policy Polling. By August, Quinnipiac found support climbed to 29 percent. At the end of September of that year, that number had risen to 38 percent. In October it was 43 percent, said Reason; in November, 43 again. In 2015, the climb continued. A CBS poll in February found the pro-ground troops side hit 57 percent, the first majority. By March, it was 62 percent, Quinnipiac documented. Over this past summer and fall, opinions wavered, but generally hawks won out, despite one fluke of 35 percent in May. It was 57 percent in June. 49 percent in July. 52 percent in August. 51 percent in October. 60 percent in November. But then, the decline began. On December 7, a CNN poll saw support for ground troops drop to 53 percent. On December 15, it dropped again to 42 percent. Now, it’s at 34 percent, the lowest since September 2014. 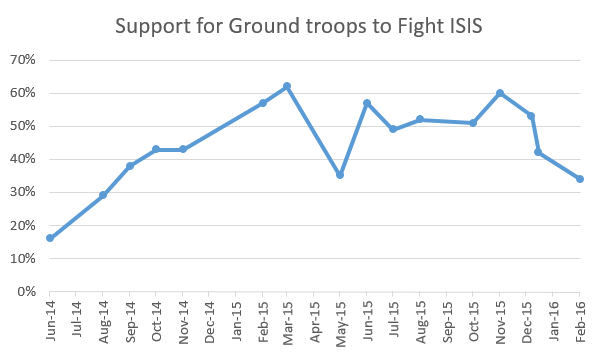 The trend line is pretty clear: Enthusiasm for ground war seems to have peaked. War-weary Americans may just be over their enthusiasm for a new ground fight. Unfortunately for us, American ground troops are already fighting ISIS, as much as the Obama administration uses incredibly Orwellian language to skirt the issue.